FAMOUS CULTURE LOTTERY says: "PEOPLE THESE DAYS ARE BAD"
Hello, I am Miss Young. I received this story from a friend. Let me call him Siamack. Go to the homepage to see more stories. DEAR MISS YOUNG : HI, HOW DO YOU DO? DIFFERENT STRANGERS & MOSTLY FROM SOME WHERE IN S. AFRICA. PERSON WHO CALL HIMSELF ( PATRICK ZUMA ). FOR YOUR MORE INFORMATION I DIDN'T SEND ANY SINGLE CENT TO ANY OF THEM, WHILE ,THEY HAVE MY MOBILE & MY HOME ADDRESS. & 419 TWO NIGHT AGO . FROM THEM INCLUDING MY OWN ANSWERS . SCAMERS & THIS TYPE OF CRIMINAL GANG & ORGANIZATION. participants. All participants were selected through a computer ballot system drawn from over 25,000 company and 40,000,000 individual email addresses and names from all over the world. This promotional program takes place every three years. Mr. omar kayi of FAMOUS CULTURE AGENCY. 2006. After this date all unclaimed funds will be included in the next stake. Dear miss young : As I told you , My only mistake was giving them my personal bio Data including the Phone numbers. Oh the CHANCE IS HERE & NOW IS MY TIME & MY LUCk . or this kind of PEOPLE . For this REASON I gave every thing they Asked . Dear Madam : Thank you very much to infotm me for the Result of your Lottery & I dont realy know what to say . But once more thank you & I keep waiting for your Instruction to guide me how to claim my winning Price Which draw on May -4 & Approved about 1,200,000 Pound Str . how to CLAIM MY WINNING PRICE . FROM this time my CONTACT & CAll started to MR . OMAR AYI . THANKS SO MUCH TO RECEIVE FROM YOU, IT IS QUITE CLEAR TO INFORM YOU THAT YOUR NAME HAS BEEN APPROVED AS ONE OF THE LUCKY WINNERS ON THE LOTTERY DRAW. I AM AN AGENT WORKING WITH THE LOTTERY COMPANY AND MY DUTY IS TO FEED YOU HOW YOU WILL RECEIVE YOUR WINNING PRIZE WITHOUT ANY PROBLEM OR DELAY. IN THIS ASPECT I WANT TO INFORM YOU THAT YOU CAN RECEIVE YOUR WINNING PRIZE IN TWO DIFFERENT WAYS . (1) BANK TO BANK TRANSFER FROM LONDON TO YOUR NOMINATED OVERSEAS ACCOUNT ( IT WILL COST YOU SOME FEE ) DUE TO THE FACT YOUR FUND IS INSURED AT THE RATE OF THE TOTAL SUM. THE PRECAUTIONARY MEASURE IS TAKEN IN ORDER NOT TO PAY THE WRONG PERSON OR TO AVOID MEMBER OF OUR MANAGEMENT NOT TO TAMPER WITH WINNERS PRIZE. (3) THIS FUND CAN BE SHIPPED TO YOU AS A CONSIGNMENT THROUGH DIPLOMATIC MEANS BY THE TRANSFERING BANK AGENT IN DUBAI (UAE), MADRID SPAIN,AMSTERDAM,INDONESIA,MALAYSIA AND IN LONDON. THE FUND CAN BE SHIPPED TO ANY OF THESE COUNTRIES THROUGH DIPLOMATIC MEANS BY THE TRANSFERRING BANK AGENT HERE SO THAT YOU WILL TRAVEL THERE AND MEET THE AGENT TO CLEAR THE FUND FROM HIM AS A CONSIGNMENT. READ THIS MESSAGE WITH CARE AND INDICATE IF YOU WANT BANK TO BANK TRANSFER OR IF YOU PREFER THE FUND TO BE SHIPPED TO YOU AS A CONSIGNMENT TO ANY OF THE COUNTRIES MENTIONED AND NAME THE COUNTRY SO THAT I WILL HASTEN THE SHIPPING ARRANGMENTS AND GIVE YOU THE PROCEEDURES. YOU ARE ADVISED TO BE FAST IN GETTING BACK TO US AS WE HAVE LIMITED TIME TO ATTEND TO EACH INDIVIDUAL. AWAITING IMMEDIATE RESPONSE AND DO NOT HASITATE TO CALL ME. Mr Omar Kayi : Dear Sir : Once more I would like to thank you for your kind & Fast Reaction ,also the Consideration you have taken in this regard. In this case & as you know the bank to Bank Transferring is Easy & Safe , & also Less difficulty to you as a Agent . I can have my US dollar Account by Max four days from now on & submitted to you the Exact number including full Address. by ten days before to arrange the air Ticket & other traveling document. 1-How much is the Cost of Bank to Bank Transfer .? 2-Is that possible to Re duct the bank Charges from total Amount ? 3-Which way is better according to your Ex princess , to Travel OR BAN transmission .? 4- Please tell me what kind of Document I must Per pare to CLAIM my Price ? 5 -How much is the Net Amount of my Winning Price. ? Again , thank you for your kind Attention & I hope to Meet you to answer at least A part of your Kindness. the 3rd Country ( DUBAI ) to cash my prise . And it is the rest of the story , Happen to me . How are you today? Sequel to our telephone conversation and your mail i read this morning. I suggest you travel to dubai and have your money cash, our agent will be going to dubai in order to assist you. Therefore, start arranging being in dubai by saturday this week as i have submitted your details to the shipping company. My reason for asking you to go to dubai is for you to have your prize cash and to deposit it in the bank there without opening dollar account as it will put you into more expenses. There is a bill known as inheritance tax which you would pay to british government which would be about six thousand nine hundred british pounds. Which i indicated to you will not be deducted from the total sum. For this reason it will be easier for you and affordable to go to dubai. Bear in mind also, that the tax will not be deducted from the total sum due to insurance bond placed on winners prize. This is a precautionary measure taken by our management for the safety and smooth delivery or transfer of winners prize. So the tax cannot be deducted. 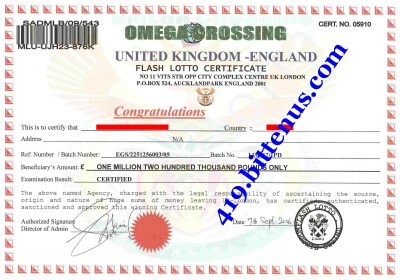 The net amount you won is one million two hundred british pounds and in dubai you will have it cash.The document you will be travelling are your international passport and details of your winning prize. Which you must have to scan copy of your international passport and send to us. With these details and assistance of a nice agent i will appoint, you will have your fund very easy to deposit in the bank. Only i advise you to compensate him for whatever assistance he might render to you. Do not bother yourself about safe delivery of your prize as i will be instructing the necessary step to be taken to see smooth process of your prize. Be informed your airway bill will be out by wednesday and i will scan copy of it and send to you. Certainly it will be one of the documents you will present to the diplomat as the real beneficiary of the prize. Do call me as soon as you respond to this mail in order to attend to your file fast. Dear Miss Young : You will see in this Mail including my Answer . SEE YOU & IT IS THE BEST WAY NOT TO PUT ANY CHARGES . Dear Mr Omar kayi :Once More thank you To be on time & send me this Mail . I must be grateful to you & all who are working in that company , including all the Agents All around & ready to give Services for those who nee dd their Guidance's Support , Just like me . So according to your Suggestion & recommendation for traveling to Dubai ,,I am also Agreed with you , but the rush up of this program I afraid not to be able to arrived on time. Just for your information I get out My Traveling document & checked for that VALIDITY of my PASSPORT it got Expire & it was VALID until the 12/12/2004 & there is no any Space for EXTENT ION which means it must Change & full 10 years has been USED. In this case from now on I need 10 working days to arrange a New PASSPORT & few days more for Dubai Visa for Entry to UAE , almost Two weeks time I need if Starting Tomorrow I Apply & follow up my document Seriously. Above Mentioned time is REA LY NEEDED to Progress this matter. Therefore you are kindly Requested to arrange this Schedule by 24Th of Sept 2006 your Agent may meet me in Dubai if you dint mind. The other parts & all your explanation was Clear to me. For Inheritance Taxes to British Government it is almost usual every where , but you must Arrange Some how it will be Paid by Agent or you Or other possibility , so that upon receiving that fund I will Return same Amount with Some additional as a Tip . Because at this moment I dint have enough CASH to Progress my PASS, VISA , TRAVELING INSURANCE , EXIT & AIRPORT TAXES & some Pocket MONEY for very first day of Arrival in Dubai & some Unexpected Expenses. I hope you understand my Situation at this Moment. For Sure I will not forget this kindness of yours & your company . And I will Repay & Answer this Consideration in the very best WAY. I thank you again & if you reply my mail by Sept 12 , I will move faster to insure the Date of our meeting. HOW ARE YOU TODAY? GLAD YOU UNDERSTOOD MY MAIL CLEARLY THOUGH YOU DID NOT GET ME CLEAR REGARDING THE INHERITANCE TAX. I WAS EXPLAINING TO YOU IN CONNECTION SHOULD YOU CHOOSE BANK TO BANK TRANSFER YOU WOULD PAY INHERITANCE TAX. IT IS BETTER YOU KEEP THAT ASIDE SINCE YOUR PRIZE IS GOING TO DUBAI THROUGH DIPLOMATIC MEANS. IT IS ONLY APPLICABLE TO WINNERS WHO CHOOSE BANK TO BANK, YOU ARE NOT REQUIRED TO PAY THAT. ALL YOU NEED TO DO IS TO DO ALL WITHIN YOUR POWER TO SEE YOU WOULD BE THERE IN DUBAI ON THE 24TH AS YOU WANTED. I HAVE DONE WHAT I SHOULD TO SEE YOUR PRIZE IN DUBAI ON OR BEFORE ABOVE DATE. WE DO ADVISE WINNERS TO REMAIN CONFIDENTAIL UNTIL THEY RECEIVE THEIR PRIZE. CONSIDERING THAT PEOPLE THESE DAYS ARE BAD AND FROM PAST EXPERIENCE YOU MIGHT INFORM SOMEONE CLOSE TO YOU AND WHO KNOWS. SO BE CAREFUL UNTIL YOU RECEIVE YOUR PRIZE. DO NOT HASITATE GOING FOR YOUR PASSPORT TODAY TO AVOID FAILING THE DATE YOU WOULD BE IN DUBAI. Dear miss young : in this mail they are PUSHING ME . But in FACT I WAS NOT RUNNING OF CASH OR NEEDED MONEY . IT WAS IN MY MIND TO GET THE PRISE & HELP TO SOME NEEDED PEOPLES. CALLS HIMSELF OMAR AS A HUMAN , BUT GANG & dANGEROUS TO EVERY BODY. Dearest OMAR : How shoud I Say Thank you. Ok,sir ,as you said From tomorow I will complete All the Neccessry document and I will Try to apply /for the passport . Please you Also Cordinate with the ke y A & try to Progress My PASSPORT & Present this Newly . Also for A Very Satisfied . So just among the 9 nominated Participant ..
Andalso for Inheritancess TAX IS ONLY APPLY IF YOU USE the good & more Effectable. Method means Bank to Bank Transfer & You may Say at this Moment , Everythings are in ORDER . & All the Items are CLEAR. Price so Difficult to beiive. How are you today? Thanks very much for appreciating my effort towards claiming your prize. I continue advising you to remain confidentail until you recive your prize, even when you receive your prize continue being humble as i see this money as you mentioned to better the life of the poor masses. Do all within your power to get your documents ready and be sure to be in dubai on or before twenty fourth of this month. We are waiting for the airway bill by today.As soon as it is out it will be scanned and send to you. Definitely, we are going to see each other and when we see that is to get familiarised the more. Dear Mr OMAR : How are you ? In this time I Relay Believed that Won That Price ..! Regarding to your Comment Which you Mentioned We will meet on DUBAI & I am hoping to be able to REPAY Some part of your Kindness which you done to me. As you know this grateful NEWS was given by you & at first I cant/; Believed & Consider that as Jockey only. Any way thanks a lot & May God BLESS YOU AND YOUR BELOVED FAMILY. THANKS VERY MUCH AS I UNDERSTAND YOU WILL NOT FAIL ME WHEN YOU RECEIVE YOUR PRIZE BY APPRECIATING MY EFFORT TOWARDS YOUR PRIZE. CONTINUE KEEPING ME POSTED AS I AM AT YOUR SERVICE. Subject: How Lucky I am. HOW ARE YOU TODAY? PLEASE KEEP ME UPDATED OF THE LATEST DEVELOPMENT AS I AM WORKING TOWARDS ACTUALISING THE AIRWAY BILL. COME IN DUBAI AS FAST AS HE LIKES'. AT THIS TIME ONLY I STARTED TO BE SUSPECTED TO THIS FUND. THEIR ACTING WAS SUDDENLY CHANGE & HE WAS TOO HARRY . SO , FOR THIS REASON I STARTED TO ASK SOME DOCUMENT FOR MY OWN PROVE & BELIEVE. SEND & THE REST OF THIS TRUE STORY. you right a way . fast in Progress you may wonder ! I hope you got what i Mean /? Slow Motion is Nature of this section all around . dont worry , my Expection to get new Pass will be next week same as today. How are you today? I really understood your plight but i suggest you keep pushing until you have your passport. When exactly do you think you would be going to dubai, this question is for record purposes. As i should be giving report reason for you not claiming your prize before now to our management. also there by Following week We can meet in DUBAI for Sure. my PRICE will be end of Dec 2006 , which we are going to Complet that in sept.
invitation Or I dont Know what EXACTLY you Suposse to send me . to SHow them I HAVE SOME URGENT Busssyness . So if youCAN HELP in this matter Pls do it & do it aas fast as POSSIBLE . Subject: IT IS YOUR RESPONSIBILITY. HOW ARE YOU DOING? I REALLY UNDERSTOOD YOUR MAIL AND EFFORT YOU ARE PUTTING TO GET YOUR PRIZE. CONSIDERING THE FACT YOU WILL GET YOUR PASSPORT THIS WEEK, START IMMEDIATELY TO SEEK FOR TOURIST VISA FOR YOUR TRIP TO DUBAI. INVARIABLY, YOU CAN USE YOUR COMPANY NAME TO SEEK FOR BUSINESS VISA. WHICH I WILL SUGGEST AND PREFER TOURIST VISA AS YOU WILL GET THAT QUICKER. ALTERNATIVELY, SHOULD YOU BE INCAPABLE TO GET THE VISA YOURSELF THEN I WILL INSTRUCT THE DIPLOMAT WHEN HE ARRIVES TO GET VISA FOR YOU AND SEND TO YOU THOUGH THIS WILL COST YOU SOME MONEY.IT IS NOT OUR RESPONSIBILTY TO SECURE VISA FOR YOU RATHER I AM DOING THIS BECAUSE BOTH OF US HAS COME A LONG WAY AND HAVING IN MIND YOU WILL COMPENSATE ME NICELY WHEN YOU RECEIVE YOUR PRIZE. YES, THE DATE TO GET YOUR PRIZE CLAIMED IS BEFORE DECEMBER BUT IT IS ADVISABLE TO GET IT DONE THIS MONTH AS I AM AMONG THE TOP AGENTS AND I KNOW WHAT IS HAPPENING HERE, HENCE ASKING YOU TO BE FAST. TRY ALL WITHIN YOUR POWERS TO GET YOUR VISA AND BE THERE SOONEST. Dear Mr OMAR : Hi, & How do you do ? As I Heared Your Voice on Phone it Seens you were too much Happy ? What was the Story ? New Girl , New Car, or prehaps New TREASURE ? What ? What happen to you ? I hope we will have Few Unforgetable time , Which will not Ever , & Never REPEAT again... Ok ...I Hope I didnt get Mistake to Choice YOU . Sure not. we will do it in the best Way ,but in the West . They ask me to change those ID Picture Size & it must be 6Cm by 6 . I said why you didn"t tell me last Time When I was here . You know what is the Answer of the Guy in Visa Section ? HeSimply Smiles & Said that : Last week I did not Notice those ID Picture is Too Small . I ask him what about now ? How you Notice this Important Problem of NASA? Pice of Broken Ruller. Oh My GOD . by Next Week to follow up my Apllication . This is the latest Progress So far . Then Air Ticket Reservation & reconfirmation will be Matter of two days only. Mr Omar can you tell me how Many Working Days we needed time for this JOB Completion ? Not to Aproach their WEEk END ,Which Means Thr & Friday. Dont you think so ? Or their holiday is on Sat & Sunday , Which one ? Ok , nothing more to updating you , In MATTER of FACT I miss you only. THANK YOU FOR KEEPING ME POSTED AND I WAS HAPPY SPEAKING WITH YOU THAT PARTICULAR DAY. I HAVE NEVER BEEN IN GOOD RELATIONSHIP WITH A WINNER AND OURS IS DIFFERENT. IN AS MUCH AS I AN YOUR AGENT, WE ARE WORKING TOWARDS CLAIMING YOUR PRIZE AS ONE FAMILY. HOPE YOU UNDERSTAND? REGARDING YOUR VISA DEFINITELY YOU WILL GET IT AS I AM ALWAYS IN PRAYER. UPON YOUR ARRIVAL IN DUBAI IT WILL TAKE US TWO OR THREE DAYS TO PERFECT EVERYTHING. YOU NEED TO KNOW HOLIDAY IN DUBAI IS THURSDAY AND FRIDAY, SATURDAY THROUGH SUNDAY IS WORKING DAYS. WHEN EXACTLY DO YOU THINK THE VISA, TICKET AND CONFIRMATION WILL BE OUT IN ORDER TO START ARRANGING FOR THE SHIPPING? Dear Mr OMAR : Hi, How do you do ? Please find Attached copy of New Passport for any Legal Purposes. and More or Less Max 2 days for Air ticket RESERVATION & Confirmation. time & return DATE . HOW ARE YOU TODAY? AS I AM FINE AND ALSO RECEIVED ATTACHED COPY OF YOUR INTERNATIONAL PASSPORT. SINCE YOUR TICKET AND RESERVATION WILL BE READY ON THE 14TH, START ARRANGING YOURSELF TO BE IN DUBAI ON THE 16TH OF THIS MONTH. PLEASE I HOPE YOU WILL BE THERE AS I WOULD NOT WANT YOUR PRIZE TO BE IN DUBAI WHILE YOU WOULD NOT BE THERE IN ORDER TO AVOID COMPLICATION. MORESO, I WILL APPROACH THE SHIPPING COMPANY TODAY TO FIND OUT HOW MUCH IT WILL COST FOR THE FREIGHT AND HANDLING CHARGES OF YOUR PRIZE THERE IN DUBAI . BY TOMORROW YOU WILL HEAR FROM ME IN ORDER TO ARRANGE THE MONEY TO AVOID DELAY IN RAISING THE MONEY. Dear Mr OMAR : Hi, How do you do ? I hope you are in good Condition . Arrival time is about two Hours Later . So Please Give Advise , about DATE , Dep Time , Arrival , Necessary Document , & etc As Soon as Possible so that I will have Enough time To FINALISE my FLIGHT SCHEDULE. Subject: WAIT FOR MY CALL LATER TODAY. FURTHER TO YOUR TELEPHONE CALL AND MAIL YOU SENT, VERY BUSY IN MY OFFICE AS I HAVE SO MANY FILES TO ATTEND TO. I AM WAITING FOR THE AIRWAY BILL TO BE OUT FROM THE SHIPPING COMPANY. THERE IS EVERY POSSIBILITY IT WILL BE OUT TODAY AND I WILL SCAN IT TO YOU IMMEDIATELY I RECEIVE IT. DEFINITELY YOU PRIZE WILL BE IN DUBAI ON MODAY, SO CONCLUDE EVERY ARRANGEMENT ON YOUR SIDE. SHOULD THE AIRWAY BILL COME OUT TODAY I WILL CALL TO INFORM YOU. this busy days at your office. As I inform you I Reconfirm my Departure from here on Tuesday Oct/17/2006. Parameters will have few min Difference. than regular time Same as VISA , so I Spend all I had Plus my LAST & advance this mount Salary to Finish this Unexpected Expenses . that amount in case we don't have any other choice. we got the Fund with some additional Interest for few hours , or half day. Return to you if you don't mind . Any way Thank you once more for all you done . Same Week on FRIDAY & I will stay almost four days. & Mrs Rose Ngosi the LOTTERY COORDINATOR .? Or as a RECORD you must inform them & I will do mine ? Me also I must bring those SECRET Number just like : REFF , BATCH, WINING & so on ? HOW ARE YOU TODAY? YOU REALLY KNOW I AM BUSY IN MY OFFICE, MOST TIMES I LEAVE OFFICE ABOUT 7PM. MAKE SURE YOU DID NOT FAIL BEING IN DUBAI ON TUESDAY AS WE ARRANGED. DO ALL WITHIN YOUR GOOD NAME AND FINANCIAL STRENGTH TO RAISE THE MONEY. I SUGGEST YOU BORROW MONEY WITH YOUR CAR RATHER THAN SELLING IT. IMMEDIATELY YOU COME BACK FROM DUBAI YOU PAY BACK WITH INTEREST AND EVEN TAKE THE PERSON OUT FOR DINNER. BEAR IN MIND THE MONEY IS USD 8980 NOT 6980. BE REMINDED THAT YOUR PRIZE IS INSURED AT THE RATE OF THE TOTAL SUM AND NOTHING CAN BE DEDUCTED FROM THE MONEY SUBJECT TO WHEN IT IS DELIVERED TO YOU.THEREFORE, WITHOUT THE CHARGES AT YOUR HAND THEY WILL NOT RELEASE THE FUND FROM THE DIPLOMATIC SECTION OF THE AIRPORT. PLEASE THIS IS VERY IMPORTANT TO AVOID DELAY AND DO NOT MAKE ANY MISTAKE AS I PERFECTED EVERYTHING ABOUT YOUR PRIZE AS IF IT IS MINE. TO STAY FOR FOUR DAYS IS FINE AS IT WILL GIVE US ENOUGH TIME TO DISCUSS AND KNOW EACH OTHER FINE. FINALLY, DO NOT FAIL COMING WITH THE DETAILS PROVING YOU WON AS YOU STATED IN YOUR MAIL, IT IS VERY VERY IMPORTANT. PLEASE THE MOMENT THE DIPLOMAT ARRIVES DUBAI ON MONDAY THEY WILL CALL YOU SO ALWAYS HAVE YOUR HANDSET CLOSE TO YOU IN ORDER NOT TO MISS HIS CALL. EVERY ARRANGEMENT HAS BEEN PERFECTED AND DO NOT DERAIL WHAT I HAVE DONE TO ACHIEVE SMOOTH DELIVERY TO YOU. DEAR OMAR :HI , IT IS A LONG TIME I HAVE NO NEWS FROM YR SIDE. ANY WAY ,I MISS YOUR MAIL & YOUR VOICE. AS I AM SURE YOU KNOW THIS THING MUCH BETTER THAN ME . ALL THE E. MAIL SENDING OR RECEIVING IS JUST GOOD AS A INFORMATION. WHICH MEANS NONE OF THOSE WILL BE ACCEPTABLE AS A OFFICIAL DOCUMENT. WHICH I DONT HAVE IN MY HAND . EXCEPT SO MANY COMINIUCATION VIA E, MAIL. WILL DO WHAT EVER YOU SAY . DOLLAR TO YOU OR TO YOUR REPRESENTATIVE OR WHO SO EVER. I HOPE YOU UNDERSTAND VERY WELL WHAT I AM ASKING YOU. AS A ATTACHMENT WITH HIS MAIL . EMBASSY & S.AFRICAN REPRESENTATIVE IN TEHRAN FOR LAST VERIFICATION AS A FINAL STEP & BEFORE I WILL PAY TO YOU OR TO YOUR REPRESENTATIVE IN DUBAI . GREEN LIGHT TO GO A HEAD. CENT AS YOU RECOMMENDED ME & BE SURE ABOUT THAT . Subject: RECEIVE ATTACHED COPY OF YOUR WINNING CERTIFICATE. HOW ARE YOU TODAY? I INVOLVED MYSELF IN YOUR PRIZE THINKING I WAS TO TRUST YOU NOT MINDING THE CODE OF CONDUCT THAT GUIDES MY JOB. HAD IT BEEN YOU MENTIONED THIS FROM THE BEGINNING, BEFORE NOW ALL OF US WILL BE HAPPY FOR THIS FORTUNE THAT CAME YOUR WAY. MY GREATEST SURPRISE IS CALLING YOU AND NO ONE PICKS YOUR PHONE EVEN THE DIPLOMAT CLAIMED YOU ANSWER BUT WAS SPEAKING A LANGUAGE HE COULD NOT UNDERSTAND. CONSIDERING YOUR DEMAND WHICH TO ME YOU ARE RIGHT IN SOME AREAS, I AM SENDING TO YOU WINNING DECLARATION CERTIFICATE WHICH EVEN MY REPRESENTATIVE IN DUBAI HAS THE ORIGINAL OF IT. AWAITING YOUR RESPONSE BY CALLING ME. AS YOU OBSERVE MY LATEST E.MAIL ,PLUS THE ANSWER AFTER SENDING OF THAT FAKE COPY OF WINNING CERTIFICATE. HE IS WHILE I SEND THE MONEY TO HIM HIS REPRESENTATIVE IN DUBAI WILL ARRANGE TO HAND OVER TO ME THE ORIGINAL WINNING CERTIFICATE. PICTURE OF HIM BEFORE I WILL SEND A SINGLE CENT . AS YOU REMEMBER I INFORM YOU THAT ,: I WILL PLAY & TRY TO PROLONG THIS GAME , PERHAPS WITH YOUR HELP , THE 419 & SOME OTHER AUTHORITY S" HELP WE CA UGH THIS ORGANISE GANG GROUP. WHICH WAS ATTACHED TO YOUR MAIL. BUT IT WAS FIRST TIME I SAW OR HEAR SOME THING NAME OMEGA CROSSING THE ONE WHO ISSUED THAT CERTIFICATE. WHO ARE THEM ANY WAY .? AND ALSO WHAT I SUPPOSE TO DO WITH THAT COPY. IF IT IS A ORIGINAL , YES I DO WHAT EVER YOU SAY . BE SEND BY EXPRESS POST OR( DHL ). THANK YOU FOR YOUR MAIL AND BE INFORMED THE ORIGINAL COPY OF IT WITH OUR REPRESENTATIVE THERE IN DUBAI. YOU ARE NOT GIVING ME MONEY RATHER YOU ARE DOING YOURSELF GOOD. CLAIMING YOUR MONEY IS IN YOUR HANDS. At this point Siamack stopped answering Omar. The scammers did not forget Siamack. He was put on their mailing list, and in two days he received 6 new letters about hidden millions and lotteries he had won.